Originally released in the cinemas in the US on March 24th 1972, The Godfather became one of the world’s most cinematic masterpieces which was based on the novel by Mario Puzo and directed by Francis Ford Coppola. From its success, it spawned two sequels which were as equally good as the original and thanks to Paramount, they have re-released this epic in a glorious Blu-ray box set that is the perfect compendium for original fans and those who have never seen this amazing trilogy before. Not only do the original three powerful stories lend themselves well to the Blu-ray format but the video and audio quality has also been restored for this impressive technology. The original movie, The Godfather revolves around the Corleone family who are connected to the world of the Mafia. The patriarch of the family is played by brilliant by Marlon Brando whose power reaches across all parts of America as they use their brute force to extort money. During this time, the drug trade began in America and Don Vito refuses to enter this business, however rival families believe that this is a mistake and devastating series of events begins for the family. As the war ignites between families, Don Vito’s son Michael (Al Pacino) is drawn into this world that he vowed would never do. Without spoiling the storyline any further, it contains one of Hollywood’s most powerful and memorable scenes and something you don't really want to find in bed when you awake. Needless to say, the acting, directing and screenplay is one of the most engaging movies ever created and saw the birth of many stars from this movie, especially Al Pacino who is now an internationally acclaimed actor. The sequel of The Godfather revolves around Michael Corleone's role as the patriarch of the family and the rise of Vito Corleone (Robert De Niro) in New York City. As a similar premise to the first film, Michael Corleone is approached by three men led by Johnny Ola (Dominic Chianese) who are seeking a business opportunity or truce with the Corleone family. The drama begins on an attempt on Michael’s life to which leads him to the conclusion that there is a mole within his family as he attempts to flesh them out. Director Francis Ford Coppola does a brilliant job at intertwining the story of Vito through powerful flashbacks to his rise of power in New York City. Ironically, The Godfather II was toted as a better movie than the original which I have to agree but both are brilliant in their own ways. After a brief sojourn, Michael Corleone returns in The Godfather Part III which takes place several years after the previous movie. Michael’s family is no longer involved in petty criminal activities and he has even created the Vito Corleone Foundation in an attempt to increase their legitimate business ventures. Michael even deals with the Vatican with many raising their suspicions of such an agreement which fuels a dispute between his brother’s son Vincent Mancini (Andy Garcia) and Joey Zasa (Joe Mantegna) who runs the family business in New York City. To compound the situation, Vincent has started a relationship with Michael’s daughter Mary (Sofia Coppola) which causes emotions to flare as Michael attempts to keep peace within his family and vows to continue down the legitimate business path. The third movie is considered the last chapter of the series and makes a fitting end to a man’s birth, his fall and his rise. It should be remembered that these movies were filmed several years ago so these films cannot be compared with the latest special effect Hollywood block busters. However, with the blessing from Francis Ford Coppola, the restoration of the video and audio does not take anything away from the original presentation, however certain aspects have been improved for the Blu-ray format. With this in mind, this is as close one will get to the original theatrical release in terms of video quality. The audio of the movies have also been restored thanks to the Dolby TrueHD 5.1 soundtrack which still sounds quite phenomenal and hearing that Godfather theme again, still brings back memories of this amazing masterpiece. 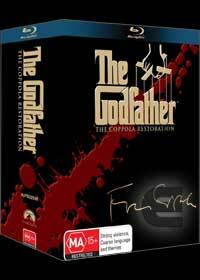 The Godfather Collection comes with a bonus disc of special features plus commentary by director Francis Ford Coppola whose passion and creation of this series is still as prevalent as it was yesterday. The bonus disc is quite impressive and features a look at not only The Godfather trilogy but also the history of Hollywood at the time. The bonus disc is a wealth of information that fans and new comers will simply enjoy and unlike some discs, they are not as dry or boring. At the end of the day, this is one of the most impressive Blu-ray collections of classic Hollywood movies that even though the series began over 36 years ago, all films still hold up well today and is a snapshot of society at a different time. All three movies were painstakingly restored to the original vision of Francis Ford Coppola and apart from three gripping and amazing movies, this set could be considered a part of movie history.